what could this be? pyotraumatic dermatitis? 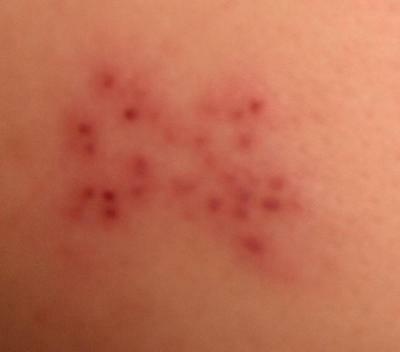 It's hard to tell from this skin rash picture what type of rash you have. 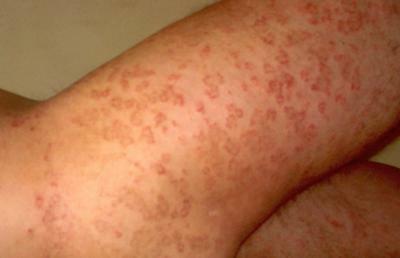 But, it does look similar to Pityriasis rosea rash. A Pityriasis rosea rash is a pretty common type of rash that is usually round or oval in size and usually occurs on the trunk of the body. This type of rash is also usually pretty itchy and can last for 6 to 8 weeks. The Pityriasis rosea rash is sometimes confused with either ringworm or nummular eczema. 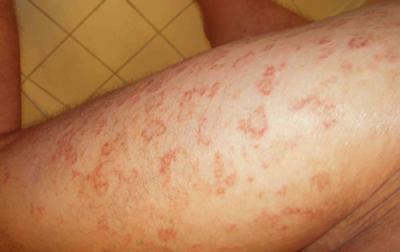 Click here to see what psoriasis looks like. You probably should see a doctor for a more complete diagnosis and rule out anything more serious. 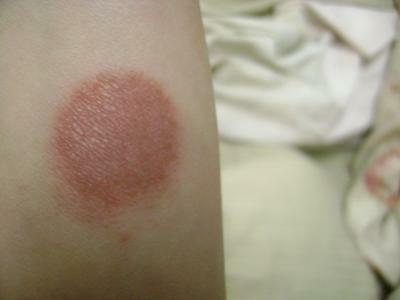 For example, if it is ringworm, it can spread to other parts of the body....so medication is necessary. Either way, Pityriasis Rosea needs to be treat with medication also. Some doctors may prescribe erythromycin for a few weeks. Some studies show that exposing the affected area to sunlight could help heal it faster. Sometime, just simple oral antihistamines and/or topical steroids could help too. My boyfriend and I have this rash that we can't figure out for the life of us! First it started with me.. on my wrist.. it was just very dry n almost peeling with a couple small bumps. And it wouldn't go away. I'm allergic to nickel so I used the steroid cream I have for it on that and it went away for a couple days. But then I started getting it on my arm too. And then he got it on his wrist. Now we both have it pretty much everywhere. Some of it is kind of flat dry clusters of bumps, other places is just a single tiny bump that almost resembles a pimple and if you pop it there's clear fluid. We've changed everything from soaps to laundry soaps to.. anything you can think of! (we even suspected fleas but we've ruled that out now too... we do have 2 dogs and 2 cats) Another doctor said it's a type of eczema... but how do we both have it at the same time and neither of us have ever had it before? And nothing is working for this INTENSE CONSTANT itch!! We've tried everything from zyrtec to cortisone creams to Gold Bond medicated lotion and even prescription steroid creams. Boy, that sound strange. And since you and your boyfriend both have it, it sound like it's something you're both coming in contact with around the house...like soaps, laundry detergent, fabric softeners, and maybe some type of food. Ruling out these factors is difficult, because you have to eliminate only one at time and wait a few weeks. If you try to eliminate too many, you'll never know which one it could be. I use to get really bad reactions from bug bites and they resembled a pimple that would have ooze little bit of liquid when popped.... like the one you described. Maybe your animals are bringing in some type of bug or red aunt from outside - especially now that spring is here and the weather is warmer. Do any of your animals sleep with you? Mine do and I know I've been bitten from something they brought in from outdoors. I'm 13 years old..I have psoriasis on the back of my neck.. I've had it for 2 years it wont go away I've tried psoriasis gel but it doesn't work. And I am getting a rash on my legs and arms. And I also have acne all over my face.. Can you help me? I'm sorry to hear of your skin problems. This is such tough time to be dealing with acne and it's very common for someone your age. Hormone fluctuations are usually to blame for those nasty breakouts. Finding the right acne product is difficult and a lot depends on how bad it is. When I turned 13 my whole face and especially my forehead broke out and it seem to stay like that for almost a year. The best product that worked for me - at least to keep it under control - was Stridex pads. I wiped my face and forehead once in the morning and once in the evening before bed and it really helped. Unfortunately, I really don't know what product will be best for your case......it sort of has to be a trial and error process. Try to make sure you use a good, pH balanced face wash too. Keep in mind that sometimes we make our skin condition worse by over-drying or over-washing it. Make sure your face wash is not too strong - as many acne products can be. If your face is red, flaky, or peeling, then whatever product you're using could be too strong and is just irritating your already inflamed and irritated skin. If that is the case with you, try switching to a milder wash....like Cetaphil. Don't pay attention the commercial hype of a product - pay attention to how your skin reacts. As far as your psoriasis and skin rash, you should have parents take you to a see a doctor - as there could be something else going. Psoriasis is a difficult skin condition to deal with. Some people believe that it could be related to immune system disorder or even allergies. You said you tried psoriasis gels and they didn't work. A good psoriasis treatment cream should help your skin shed dead cells quicker. Psoriasis causes rapid cell production and that is what gives it that thick, patchy look. If you can exfoliate the extra dead cells, you can help clear up some of those patches. The National Psoriasis Foundation suggests that a diet low in sugar and white flour might help in reducing the symptoms. So you may wish to take a look at your diet and see if you can improve it. I'm very sorry I couldn't give a more helpful answer or solution. But I really believe you should see a doctor and see what he suggests. There might be some connection between the rash and psoriasis. I noticed yesterday a perfectly circular, quarter size and all red spot on my inner forearm. It does not itch but it is tender to the touch. Can you help me figure out of it is, a bite or ringworm, etc? Thanks for your question. A ringworm rash is circular in nature like your rash, but usually the boarders are a little darker and the middle is a little lighter...and sometimes more raw (wet) looking. If it is a ring worm rash, an antifungal cream like Lotrimin or Tinactin can help. In more severe cases that won't respond to creams, you might need a oral prescription from your doctor. However, your rash looks very similar to a Lyme disease rash. Many people usually misdiagnose this type of rash, because it can vary in size, appearance, and color. But it's usually round in size. And the symptoms can vary too..they can be painless, very itchy, sensitive, or hot to touch. Lyme disease has been on the rise since lately, and the states with the highest number of cases include: Rhode Island, New York, New Jersey, Delaware, Pennsylvania and Wisconsin. Lyme’s disease is a dangerous disease that always needs medical treatment. If you've been outside lately, where you might have come in contact with ticks....I would strongly suggest you see your doctor soon. I don't want to scar you, but it's better to be safe than sorry. I hope this has helped. Please feel free to write back and tell me how it goes. please help! what type of rash is this?? I am having this very itchy rash all over my body (legs, arms, armpits, feet...). Went to the doctor and he prescribed strong anti-fungi (cream and pills), but its been a week of taking medicine and its not getting better still... could it be psoriasis???? Now its been over a month that I'm with this rash. From the information I've seen on psoriasis, your situation does not look like psoriasis, but more like eczema or just a basic rash. See What Does Psoriasis Look Like and Pictures of Eczema. Generally, the anti-fungal prescription pills take some time to "kick-in" and start to work. You should contact your doctor and tell him that you have not received any relief from the medication. He might need to prescribe a stronger or different one. You can also try showering with a anti-fungal shampoo called Nizoral. You can find this in your local drug store near the anti-dandruff shampoos. You can use this shampoo over your whole body...but try a small area first to make sure it agrees with your skin. Over time, this shampoo can help reduce that itching sensation. It's also great for scalp itch too. Finally, keep a diary of your flare-ups. Is there possibly a connection with a certain food or detergent that you started using? If you have certain days where the itching is worse, examine what you did that day that was different from others. You could be allergic to something (food or laundry soap or a new body cream....) and this is the body's way of dealing with that allergy. Would a dermatitis cream help? I have been to the dermatologist and I have this rash that does not itch but burns. It is in the crease between the leg and the groin. It seems to be on both sides and sometime gets inflamed. I have tried about 15 different types of things. From $20 to $250. The doctor seems to think it is being caused by the hair rubbing. When I shaved the area it made it worse. I do not know if the Dr. Itch thing would work or not. I am tired of paying lots of money for things that do not work. Do you have a FREE Sample in a mini form you could let me try? I did want to add that long ago I had a scar from Jock Rash in High School. The area around by the scar would get inflamed periodically but about a year and half ago I went to the dermatologist and he gave me steriod cream. Then another and another. Seem to thin out the skin and I was getting strecth marks that were becoming painful, so he stopped that treatment. I use powders and things but it seems I can be in sixty degree weather and I will be sweating profusely. It can be cold outside and it seems like it gets worse. I do have Diastasis Recti and I do not know if this could be some side effect from the stress of the muscle issue. I do seem to have itching all over my body. Blotchy skin. I had a couple of precancerous spots but I just look blotchy. That's sort of where my itch problem was. In the crease between the groin and inner thigh area. What made me try Itch Dr. is because it's helpful for that area too and helps to balance the yeast, bacteria, and fungi on the body. I assume since that area is so closed in -- any irritation/itch/burn could be due to bacteria or yeast. I contacted the company that makes Itch Dr. and they do not have samples, but they do offer a very generous 1 year guarantee with complete 100% refund. I too spent lots of money on creams and planned on sending this back if I didn't like it. I still have to use it occasionally, but my comfort time is much longer than with other products I've tried. You mentioned that you have an itch all over the body. They also make a product you take internally for all over itchy skin/scalp called Skin Dr.. The company suggests that the two products together work pretty well. I have not tried that one. You might consider trying the 2 products together for at least 30 days -- that is the time frame that suggest for best results. If you're unhappy, just send back the opened and used products (you have up to 1 year) with the invoice or order number to the manufacture. They will refund your money in 3-7 business days after they receive your products. So if you do decide to take a chance....just make sure to keep you invoice or order number handy in case you need to send it back. I understand your frustration and I wish I could have helped more. I'm tired of spending money on products that don't work. That's why I only purchase from companies that have a generous return policy. Did you know some companies say they have a return policy -- but don't tell that it's only good on UNOPENED products? How silly is that? How would I know if it will work or not if I can't open it and try it!!!! If you do try it, please let me know how it goes? Any opinions on what this rash is? I have taken my daughter to the hospital this morning as soon as I saw the rash, 4 nurses and 3 doctors couldn't give me a straight answer except that it's not meningococcal or measles. They couldn't tell me whether it was viral or allergic. We have not changed any products or foods in our house for her to be allergic to. She has green diarrhea, and for the last 4 days has been complaining of sore arms and legs and 5 days ago had a temperature for one day (which is since completely gone). She is still drinking but not eating as much as usual. Any ideas? I can't seem to get a straight answer from a doctor. Oh, your poor baby, she must be so uncomfortable. And it must be very difficult on you too. Not being able to make her comfortable quickly. There is nothing worse than seeing your baby sick and miserable and feeling helpless. Before I start, please keep in mind that the advice and information I'm about to provide is not a medical diagnosis, just an observation from a non-medical person. 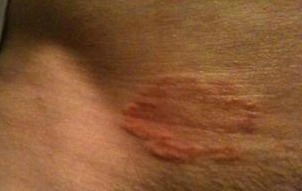 However, looking at the picture you sent in it looks like it could be either atopic dermatitis or hives. However, the more I read about hives and re-read your description of her symptoms...it sounds more like hives. Atopic dermatits can dry skin, itching and a somewhat raised rash. It's non contagious and sometimes forms small fluid filled blisters. While doctors are not clear what causes it, they do know it generally appears on those who have a history of allergies, asthma or a sensitive immune system. 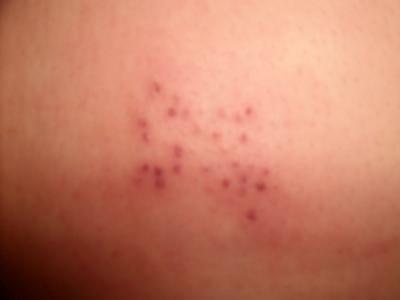 The other type of rash -- looking at your picture -- could be hives (urticaria). Hives look like welts and are often itchy and sometimes even sting and burn which could be why your baby is complaining of sore skin. This type of rash could be considered serious if it's accompanied by difficulty breathing. So keep an eye on that. The offending drugs and foods that can cause hives to crop up are: aspirin, penicillin, and foods like eggs, nuts, and shellfish. Other factors include food additives, temperature extremes (going from hot to cold air), and infections like strep throat. All of these factors listed above can cause hives. You mentioned that your baby had a fever, well fevers are sometimes due to an infection. Often times if you can remove thing that triggered the hives, the rash goes away. Here is what I would do: Think about the things that are known to trigger hives...has your baby been exposed to any of the ones listed above? Just because a certain food didn't bother your baby before doesn't mean she's not allergic to it now. Allergies often just show up like that. I would go back to a family doctor or better yet a pediatrician and tell them that you think she might have hives and then let them do the testing from there. Don't let them push you off so quickly -- especially if she has a fever (which could be a sign of an infection) and/or diarrhea which could be serious if she doesn't keep enough fluids in her system. One last thought -- you said you didn't change anything in her diet, but keep in mind that allergies can also come from soaps, creams, laundry detergents and things that touch your body from the outside. Good luck to your I hope this information was helpful. And please do keep me posted. I hope they find what's wrong with her quickly. Red Bumpy Skin Rash - Diagnose These Pictures? Shingles Rash? The first day after the mass rash went away and the painful bumps came. I started breaking out on my back, starting with an intense itching on my spine. The rash that came to be was large, but relatively painless. As it shrunk, it became more painful and now, the rash is replaced with raised purple/red spots and some are scabbed over. However, you might want to read/review the symptoms associated with shingles because they do sound similar to what you described. You said your rash started as patch of intense itching that became painful and scabbed over............This sounds very similar to symptoms of shingles, which can start out as an itchy rash that forms in strips or patches on the body and later blisters and scabs. For what I understand, the formation of a rash (in a strip or band) and the intense itching and pain is considered a classic sign of shingles symptoms. Shingles is a virus that effects the nerve roots of the skin, this is why it can be so painful. But the pain (or at least a strange sensation on the skin - like tickling) usually starts a few days before the rash even appears. Other symptoms that appear before a rash are flu symptoms like headache, diarrhea, chills, or stomachache. These symptoms can start days before the rash appears.....So think back before the rash formed.....did you experience any of these symptoms? While the pictures may not look similar to what you have, I would pay more attention to the symptoms and I would see doctor just to be sure. I hope this helped. Perhaps others reading this blog will write in if they've experienced this too. Hope all turns out well for you. I have had a quarter size rash appear on my neck about 14 months ago. it does not itch and it has not gotten any bigger. it is not raised or bumpy. I am a medium black male and the spot looks grey. Thanks for your email regarding a grey rash. Please understand that I am not a doctor and even if I was, it's not proper to give a skin rash diagnosis -- even with pictures -- without physically seeing a person and examining the skin. While there are many different types of skin rashes, I've never heard of ones that appear grey. You really should see a dermatologist to rule out anything serious. Since you said the area is not itchy or bumpy, but is grey, could it just be a dry patch of skin? Have you tried applying a moisturizer to see if that helps? Dry skin is very common this time of year. I'm sorry I couldn't provide more information for your skin discoloration.